Sussex captain Ed Joyce smashed a hundred after Warwickshire were dismissed for just 87, as 20 wickets fell on day one at Edgbaston. England's Jonathan Trott top-scored for the hosts with 37, but Ian Bell was one of four batsmen out for nought. Chris Jordan staked an early claim for a Test place with 3-15 as veteran seamers Steve Magoffin and Jon Lewis also picked up three wickets each. Joyce fell for 117 as the visitors were bowled out for 229 just before stumps. After winning the toss, Bell, appointed to stand in as captain for the injured Jim Troughton, elected to bat in the Birmingham sunshine. 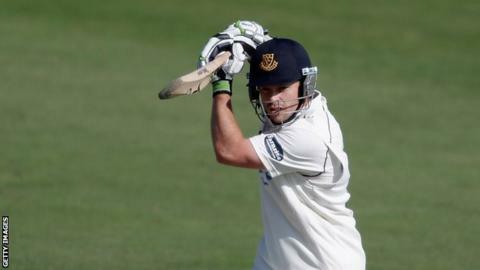 But Jordan ripped through the top order with the wickets of Varun Chopra, Laurie Evans and Bell to leave Warwickshire in trouble at 20-3. Trott and Tim Ambrose (20) launched a slight recovery with a partnership of 44, before the dismissal of the Warwickshire wicket-keeper sparked a dramatic collapse which saw the final seven wickets fall for 23 runs and the home side bowled out in just 27.5 overs. Keith Barker picked up an early scalp for the hosts as Luke Wells was caught by Trott, but Joyce then put the bowlers to the sword with a flurry of boundaries before Chris Woakes bowled Michael Yardy for nine. Rory Hamilton-Brown (24) was trapped in front by Oliver Hannon-Dalby before Joyce brought up his century off just 116 balls, including 16 boundaries. Warwickshire fought back with seven wickets after tea, including the crucial one of Joyce to Rikki Clarke, as Barker took 3-52, but the visitors still hold a first-innings lead of 142. "Sussex skipper Ed Joyce was pleased he didn't win the toss at Edgbaston this morning, as he didn't know whether to bat or bowl. "As it was, Ian Bell won the toss decided to bat, and then regretted the decision for the rest of the day. "In reply Joyce made batting look easy, his 117 including 17 fours, but from a position of 131 -2 Sussex rather lost their way, losing their last eight wickets for 98. "20 wickets in the day might suggest this is a difficult batting surface, but Joyce believes the wicket will flatten out and get slower, and Sussex know this match is far from over despite a healthy lead of 142."